This category includes the latest news on email archiving solutions, new legislation relating to the storage of email and tips and advice on implementing and maintaining email archives. Email archiving is a method of preserving emails and storing messages securely. An email archive allows employees to keep their inboxes and email account folders clear. Archives can be stored locally or on an email server, although many organizations use a cloud-based service for archiving old messages. A cloud-based archive means less storage space is required on already overburdened mail servers. In contrast to backups, email archives are searchable, allowing messages to be quickly retrieved when needed. Not only does this allow accidentally deleted messages to be quickly found and restored, it means messages can be easily located in the event of a compliance audit, legal discovery or freedom of information request. Federal and state laws require organizations to keep all email correspondence for several years. For many medium to large enterprises, that means hundreds of millions of emails need to be stored. Securely storing those emails in the cloud reduces hardware requirements, slashing the costs of email storage. An effective email archiving solution is also a necessity for businesses who collect, use, share or store the personal data of EU citizens due to the enactment of the EU´s General Data Protection Regulation (GDPR). An effective email archiving solution helps businesses comply with the requirements for the security of access control, auditing and encryption. It can also facilitate quick and effortless responses to data access and erasure requests. In addition to storing messages, archives can store email attachments, calendars, pst files, contacts, notes and instant messages, which can all be recalled and accessed quickly and easily via search UI. Email archiving for MSPs is an often-overlooked service that can add value and improve profits. Email archiving is easy to implement and manage, has a high margin, generates regular additional income, and is an easy sell to clients. In this post we explore the benefits for clients and MSPs and explain why email archiving for MSPs and their clients is a win-win. Email archiving is now important for organizations of all sizes, from SMBs to the largest enterprises. Huge volumes of emails are sent and received on a daily basis and copies of those emails need to be stored, saved, and often retrieved. Storage of emails in mailboxes poses problems. The storage space required for emails and attachments can be considerable, which means hardware must be purchased and maintained. In terms of security, storing large volumes of emails in mailboxes is never a good idea. Storing emails in backups is an option, although it is far from ideal. Space is still required and recovering emails when they are needed is a major headache as backup files are not indexed and searching for messages can be extremely time consuming. An email archive on the other hand is indexed and searchable and emails can be quickly and easily retrieved on demand. If there is a legal dispute or when an organization needs to demonstrate compliance – with GDPR or HIPAA for example – businesses need to be able to recover emails quickly and easily. An email archive also provides a clear chain of custody, which is also required for compliance with many regulations. Cloud-based archives offer secure storage for emails with no restrictions on storage space. Cloud storage is highly scalable and emails can be easily retrieved from any location. In short, email archiving can improve efficiency, enhance security, lower costs, and is an invaluable compliance tool. Given the benefits of email archiving it should be an easy sell for MSPs, either as Office 365 archiving-as-a-service as an add-on or incorporated into existing email packages to offer greater value and make your packages stand out from those of your competitors. As an add-on service, Office 365 archiving-as-a-service will generate regular income for very little effort and will improve the meagre returns from simply offering Office 365 to your clients. As part of a package it can help you to attract more business. TitanHQ is a leading provider of cloud-based security solutions for MSPs. All TitanHQ products – SpamTitan, WebTitan and ArcTitan SaaS email archiving – have been developed from the group up to specifically meet the needs of MSPs. ArcTitan has been developed to be easy to implement and manage and it seamlessly integrates into MSPs service stacks, allowing them to provide greater value to clients and make email services much more lucrative offering. On that front, TitanHQ is able to offer generous margins on ArcTitan for MSPs. If you have yet to start offering email archiving to your clients or if you are unhappy with your current provider, contact the TitanHQ MSP team today for full ArcTitan product information, details of pricing, and further information on our Alliance program. Today is World Backup Day: An annual event that started in 2010 to raise awareness of the importance of backing up data. Backups are used to recover data in the event of disaster; however, having a backup of data does not necessarily mean data can be recovered. Restoring files from backups is not always effective. Backups can be corrupted and the restoration of files can fail. While World Backup Day raises awareness of the importance of backing up data, we would like to emphasize the importance of testing backups and reviewing backup strategies to ensure they are effective. Don’t wait until disaster strikes to ensure your strategies are effective and files can be recovered. By then it will be too late. Recent research conducted by Kroll OnTrack has revealed an alarming number of companies have experienced data loss, even when backups of data were performed. Kroll polled 1,000 companies in the United States, Europe, and Australia and discovered that a third of companies had experienced a data loss incident. Out of those companies, 35% did not have a current backup and experienced data loss as a direct result. Two thirds (67%) of organizations were able to recover the majority of their data from backup files, while 13% said they could recover up to three quarters of their data. Corrupted backup files were cited as the reason for data loss by 12% of companies, but a quarter of companies that lost data said their backup system did not work as it should. A quarter of companies that backed up their data said they did not test those backups to make sure files could be recovered. A quarter said they tested backups once a week to ensure data were recoverable, and 30% tested their backups on a monthly basis. Backups are an organization’s insurance against data loss. Just as an insurance policy should not be taken out until the fine print has been read, backups should not be trusted until they have been tested. The past 12 months have clearly highlighted the importance of backing up data. Ransomware attacks soared in 2016. Ransomware is a form of malware that locks files with powerful encryption. A ransom demand is then issued to supply the key to unlock the data. Without access to that key, data will remain locked forever if a backup of data does not exisit. The only way to unlock files is to pay a sizable ransom payment. That payment could be tens of thousands of dollars. In February, last year, Hollywood Presbyterian Medical Center was forced to pay a ransom of $17,000 to obtain the key to unlock ransomware-encrypted data after it was discovered files could not be recovered from backups. Ransomware has fast become one of the biggest cybersecurity threats. Research conducted by Kaspersky Lab revealed the number of ransomware variants increased 11-fold between Q1 and Q3, 2016, by which time 32,091 different ransomware variants had been detected. By Q3 2016, a business was being attacked with ransomware every 40 seconds and 42% of small to medium sized businesses had been attacked with ransomware. 32% of businesses were forced to pay the ransom in order to recover their data. While ransomware attacks have soared, the malicious software is only the third main cause of data loss. Hardware failure poses the biggest risk followed by the loss or theft of devices. Software errors and data loss due to system upgrades round off the top five list. Backup systems can be used to continuously backup data, but at the very least a daily backup should be made. Those backups should be tested at least once a week to ensure data can be successfully recovered. To prevent data loss and maximize the probability of data recovery, organizations should use the 3-2-1 approach. Each organization should ensure they have three copies of data. The original and two backups. Those backups should be stored on two different media and one of those copies should be stored off site. The easiest option to satisfy those requirements is to have a physical copy on a storage device and a backup in the cloud. Since ransomware can encrypt data on network drives and connected storage devices, a local drive should be disconnected after the backup has been made. Take out some time this World Backup Day to test your backups and review your backup strategies and ensure that you will be able to recover your data if disaster strikes. What are the Benefits of Cloud-Based Email Archiving? Email archiving is essential for most businesses; however, many businesses are not using a cloud-based email archiving solution. In fact, a large number rely on email backups, even though backups are impractical and data loss is a very real concern. But what are the benefits of secure, cloud-based email archiving over backups? Hillary Clinton could easily explain one of the most important benefits of a cloud-based email archiving solution. If an email archive is stored locally, should the device on which that archive is stored be lost or stolen, the entire archive would never be seen again. That is exactly what happened last year. Donald Trump was quick to citizen Hillary Clinton. Not only was that archive lost, it could potentially have been accessed by an unauthorized individual. Donald Trump is keen not to make a similar mistake. He has reportedly started using a messaging app that deletes all messages once they have been read. Such an app would certainly prevent accidental disclosure, although it would not be an option for many businesses as regulations require emails to be kept for a number of years. Loss of email is simply not an option in regulated industries. Big fines await companies who do not archive or backup their emails. Emails must be securely stored and made available to auditors or organizations will be in violation of the Sarbanes-Oxley Act, FINRA, HIPAA, and the Gramm-Leach-Billey Act to name but a few. If a backup or local email archive is lost, the consequences can be severe. Take healthcare organizations for example. If a laptop computer is stolen and email backups containing electronic protected health information were on the device, those data could potentially be accessed by an unauthorized individual. That would be a violation of HIPAA Rules. The Office for Civil Rights could easily fine a healthcare organization millions of dollars for such a data breach. If emails are archived and stored in the cloud, such a breach would not occur in the event of device loss or theft. If a lawsuit is filed against a company, it may be necessary to provide copies of emails as part of legal discovery. While many companies store old emails in backups, searching for emails can be a difficult, expensive and long-winded process. For an average-sized organization searching for emails could take weeks, even though emails need to be found in minutes. With an email archiving solution, archived messages can be searched and retrieved in a matter of seconds or minutes, not weeks. A similar scenario exists for data access requests under the EU´s General Data Protection Regulation. EU citizens now have the right to request details of any data that could be used to identify them, modify it where necessary, and erase it is there is justifiable cause. Businesses maintaining a database of EU citizens will find compliance with GDPR much easier by implementing cloud-based email archiving, which also has the benefit of complying with the regulations relating to data security. Considering the volume of emails now being sent, and the requirement for those emails to be kept for years in many cases, the space required for storing email is considerable. A recent report from Radicati Group suggests the average employee sends or receives 121 emails a day. For an organization with 500 employees that is 60,500 emails a day. With 22 working days each month, that amounts to 15,972,000 emails a year. Each of those emails may only be a few KB, but over a year the storage space required is substantial. Cloud-based email archiving not only allows millions of emails to be stored, there is no need for organizations to purchase any hardware for storage. All emails are securely stored in the cloud. 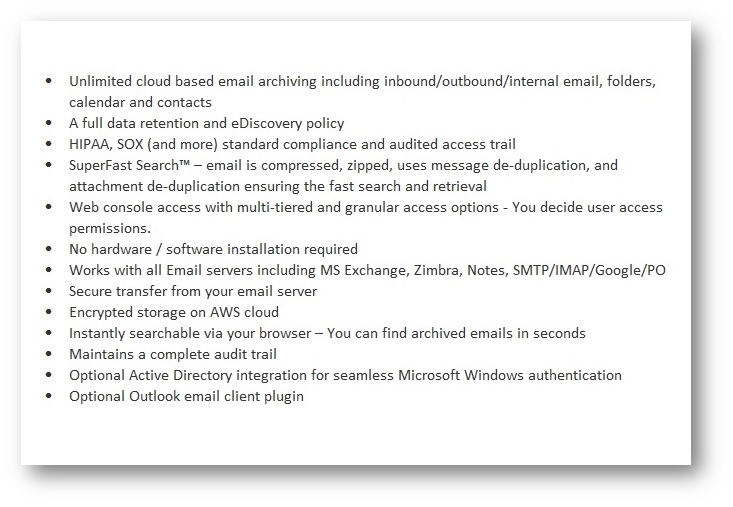 The benefits of secure, cloud-based email archiving are clear. So what options are available that provide all of the benefits of cloud-based email archiving in an easy to use, cost effective package? To meet businesses’ email archiving needs, TitanHQ developed ArcTitan – a secure, cloud-based email archiving solution that allows organizations to meet compliance requirements, search email archives quickly, and retrieve messages in minutes. ArcTitan has excellent scalability, and can be used for old email storage by companies with ten to 10,000+ email accounts. Emails can be archived from anywhere at any time, and messages can be accessed via a mail client or browser. Furthermore, with a pay as you go subscription, cloud-based email archiving is affordable for businesses of all sizes. To find out more about the benefits of ArcTitan, contact the TitanHQ sales team today!